Although breweries show a high heat demand at a low temperature level, it is relatively difficult to estimate in the first instance, if a solar heating system can be reasonable integrated into the existing processes. This is based on the diversity and complexity of the brewing process, as explained before. The basis for this decision is the detailed knowledge of the water — and energy balance of the overall production process. Some breweries don’t have any noteworthy hot water consumers beside the brewhouse, which can even lead to a surplus of hot water gained by heat recovery. In this case, the hot water is drained to the sewer and a non-concentrating solar heating system cannot be installed reasonably. Some breweries have several other hot water consumers beside the brewhouse, and need to produce the missing amount of hot water via conventional ways. And finally, hot water consumption and hot water generation can be balanced. If a change in the boiling system is planned, a new water — and energy balance has to be drawn, because of the interaction of boiling system and heat recovery. This might be difficult, since not all details are clarified before the new process is running. The link between boiling system, heat recovery and solar heating system and the associated changes in water — and energy balance shall be clarified in the following by the two considered boiling system at Hutt brewery. The dynamic low-pressure boiling affects the water balance in a significant way. 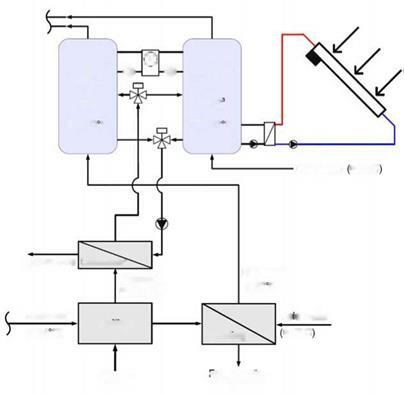 The energy of evaporated water during boiling is directly used for the closed heat recovery cycle with a high temperature level and no longer to generate hot water. The only remaining source of hot water is wort cooling, which can supply the amount for mashing and lautering. In this case, the missing hot water demand can be suitable met with a solar heating system. achieved. with dynamic low-pressure boiling. The vacuum boiling system affects the heat recovery during wort boiling and wort cooling, but with lower effect. In case of wort boiling, the amount of recovered heat decreases by two reasons: the amount of evaporated water is reduced by at least 25% and approximately two third of overall evaporation is realised under vacuum. Beside the reduced amount of evaporated water, the boiling temperature during the vacuum evaporation phase is decreased successively from 100°C to 85°C. This leads to a reduced amount of energy that can be recovered. As a result of the lower temperature during vacuum boiling phase, the wort temperature prior to wort cooling is also lower compared to the old reference boiling system. However, a detailed knowledge of all process parameters in prior is not possible, since the brewer has to adjust the new boiling system to the specific requirements, which influence the final boiling temperature and ratio of atmospheric to vacuum boiling phase. Nevertheless, both heat recovery installations are here used to heat water, which leads to an amount that should be adequate to cover the overall hot water demand of the brewery. If the actual water balance in a brewery is already balanced, an implementation of a solar heating system is rather difficult after this retrofit. To find a suitable way for the implementation in combination with this vacuum boiling system, a change in the heat recovery during wort boiling is required. In this case the condensation enthalpy should not be used to generate hot water, but to increase the temperature of the already stored water. 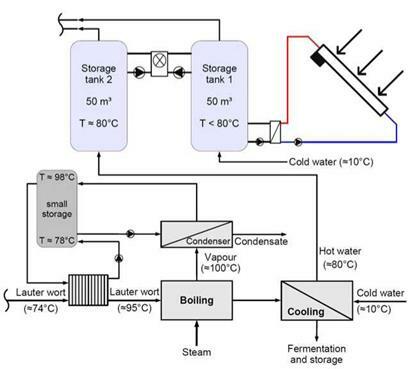 Likewise, the storage concept should consider the separation of high and low temperature level as shown in figure 3. This paper showed the large diversity in the brewing sector, especially within the process steps of wort production. Although breweries generally show a high thermal energy demand at a relatively low temperature level, a reasonable integration of solar heating systems can be rather difficult. This is based on various technical installations that are available and a high rate of heat recovery, which can also vary a lot by means of temperature level and used installations. There is no general approach to implement a solar heating system in breweries so far. It will probably always be essential to draw a detailed water and energy balance of the overall production process for every single brewery. This balance should include all accumulating hot water streams with the respective temperature level. If there will be a change in the technical installations that influences the produced and/or consumed hot water, a new balance has to be drawn. Based on this balance it has to be proven, if a solar heating system can be integrated in the existing process or not. Furthermore, the integration can be difficult, if the complete heat recovery runs at lower temperature levels to produce hot water. The authors gratefully acknowledge the financial support provided by the Reiner-Lemoine-Stiftung and the German Federal Ministry for Environment, Nature Conservation and Nuclear Safety, contract No. 0329601T. Additionally, we would like to thank the Hutt brewery (esp. K.-P. Reinl) and GEA Huppmann (esp. Dr. L. Scheller) for the close collaboration within this research project. W. Weiss, I. Bergmann, G. Faninger (2008). Solar Heat Worldwide — Markets and Contribution to the Energy Supply 2006, Edition 2008, International Energy Agency. C. Vannoni, R. Battisti, S. Drigo (2008). Potential for Solar Heat in Industrial Processes, Booklet IEA SHC Task 33/IV, CIEMAT, Madrid. ECOHEATCOOL (2007). The European Heat Market, Work package 1, Final Report, IEE ALTENER Project, www. ecoheatcool. org. C. Brunner, B. Slawitsch, K. Giannakopoulou (2008). Industrial Process Indicators and Heat Integration in Industries, Booklet IEA SHC Task 33/IV, Joanneum Research, Graz. Ernst & Young (2006). The Contribution made by Beer to the European Economy, Full report, Regioplan Policy Research, Amsterdam. DeStatis (2008). Survey of energy use of German industrial sectors in 2006. U. Jordan, K. Vajen, B. Schmitt, P. Bruchhauser (2006). Potential of Process Integration in four Industrial Companies in Germany, Proceedings EuroSun 2006, Glasgow, 27.06. — 29.06.2006. A. Aidonis, V. Drosou, T. Muller, L. Staudacher, F. Fernandez-Llebrez, A. Oikonomou, S. Spencer (2005). PROCESOL II — Solar thermal plants in industrial processes — Design and Maintenance Guidelines. Centre for Renewable Energy Sources, Greece. M. Jentsch (2005). Sudhaustechnologie Stand 2005, Brauindustrie (10) 2005, 10-16. M. Hertel, H. Dauth, H. Scheuren, K. Sommer (2008). Wort boiling: proper evaluation of boil-off processes — Part 3, Brauwelt International (I) 2008, 22-27. B. Kantelberg (2006). Modern wort production in brewhouse plants, Brauwelt International (I) 2006, 26-32. R. Mezger, (2006). Betrachtung moderner Wurzekochsysteme bezuglich ihres Einflusses auf technologisch und physiologisch bedeutende Wurzeinhaltsstoffe. Dissertation, TU Munchen.